- A detailed package of home envelope air sealing, properly installed insulation, and high-performance windows to deliver comfort, durability, and lower utility bills. - A high-efficiency heating, cooling, and ventilation system designed and installed for optimal performance. - A complete water and moisture management package to protect roofs, walls, and foundations. - ENERGY STAR certified lighting and appliances that help reduce monthly utility bills. - Onsite third-party verification, with independent inspections and testing by a certified Home Energy Rater. As a Residential Energy Services Network (RESNET®) Energy Smart Builder, Providence Homes is also committed to having all of our homes energy rated following RESNET’s stringent standards, and actively marketing our homes’ HERS Index ratings. A copy of every Providence Model Home HERS Index score is displayed in all model home sales centers. All HERS Index scores displayed are “As-Built” ratings, never “As-Designed” ratings. 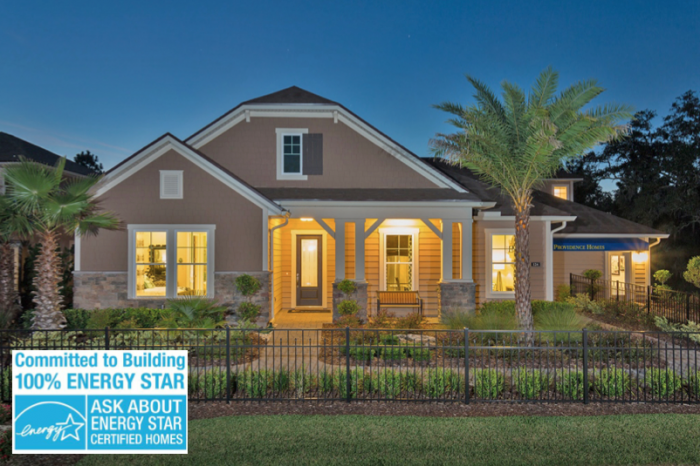 “As-Built” ratings are a requirement for a home to receive the ENERGY STAR® Label. Providence Homes’ systems-based understanding of how homes function, coupled with superior building practices, enables us to deliver homes of beauty, comfort, durability and unmatched high performance. In recognition of this commitment, Providence Homes has received the ENERGY STAR® for Homes Leadership in Housing and Certified Market Leader from the Environmental Protection Agency (EPA) in 2010, 2011, 2012, 2013 and 2014.